The Internet-based group "Anonymous" has released statements on YouTube and via a press release, outlining what they call a "War on Scientology". Church of Scientology related websites, such as religousfreedomwatch.org have been removed due to a suspected distributed denial-of-service-attack (DDoS) by a group calling themselves "Anonymous". On Friday, the same group allegedly brought down Scientology's main website, scientology.org, which was available sporadically throughout the weekend. On Monday, the group released a video titled: "Message to Scientology" on YouTube concerning their intentions to attack the Church of Scientology. A robotic voice on the video begins with "Hello leaders of Scientology. We are Anonymous," and continues by explaining their motivations: "Over the years we have been watching you, your campaigns of misinformation, your suppression of dissent and your litigious nature. All of these things have caught our eye. With the leakage of your latest propaganda video into mainstream circulation the extent of your malign influence over those who have come to trust you as leaders has been made clear to us. Anonymous has therefore decided that your organisation should be destroyed." The message goes on to state that the group intends to "expel Scientology from the Internet". The "Message to Scientology" video was highlighted as the "YouTube Video of the Week" by The Michigan Daily. Commenting on the video, the piece The Michigan Daily states "if this video is any indication, it seems like the assailants mean business." As of Wednesday, the video had been viewed 324,147 times, favourited 2,293 times, and is currently YouTube's top third video of the day. In a blog post on USA Today's website, Jess Zielinski wrote that it was "not a shock that hackers hold a grudge against Scientology," and in a followup post on another USA Today blog, Angela Gunn wrote that "those of us who remember ... the adventures of Operation Clambake are fascinated to see this kind of thing flare up again". The viewpoints expressed in the video are echoed on the so-called "Project Chanology" website, an open source of information and direction for those within Anonymous, which talks of tactics such as blackfaxing and prank calling alongside other "real-life" methods of attack. The satirical website Encyclopedia Dramatica also has a similar page devoted to "Project Chanology". "Anonymous" released a statement on Monday in the form of a press release, "Internet Group Anonymous Declares "War on Scientology": "Anonymous" are fighting the Church of Scientology and the Religious Technology Center". In the statement, the group explained their goal as safeguarding the right to freedom of speech "A spokesperson said that the group's goals include bringing an end to the financial exploitation of Church members and protecting the right to free speech, a right which they claim was consistently violated by the Church of Scientology in pursuit of its opponents." The press release also claimed that the Church of Scientology misused copyright and trademark law in order to remove criticism from websites including Digg and YouTube. The statement goes on to assert that the attacks from the group "will continue until the Church of Scientology reacts, at which point they will change strategy". 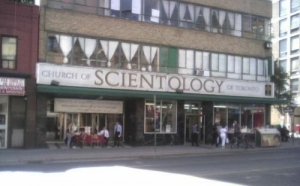 The attack was reportedly motivated by the Church of Scientology's attempts to remove a promotional video featuring Scientologist Tom Cruise from YouTube. After the Church of Scientology lodged a copyright infringement complaint with YouTube, the site took down the video. The Tom Cruise video is still available on Gawker.com, which has stated it will not remove the video "It's newsworthy, and we will not be removing it." Gawker.com discussed the actions of the "Anonymous" group, in a post on Monday titled "Scientology vs. the Internet: Why Kids On The Internet Are Scientology's Most Powerful Enemy". Gawker.com briefly outlined actions of other anonymous users critical of Scientology, including actions taken in the past by users of YouTube, Digg, and YTMND "This isn't the only group of Internet users unafraid of the intimidating cult; a whole range of sites has turned the Church into a mockery by doing what mainstream celebrity-coverage outlets wouldn't dare." A poster on the newsgroup alt.religion.scientology (a.r.s.) was critical of the actions by the "Anonymous" group. In a post titled "Open Letter to Anonymous" Jeff Jacobsen, webmaster of lisamcpherson.org, posting as "cultxpt" wrote that "It's understandable that people get upset over the things the Church of Scientology has done online and off", pointing out that the Church of Scientology had "tried to shut down a.r.s. ", and "spam our newsgroup to this day". In 1999 "sporgery", a form of nonsensical spam tactic, was used as an attempt to disrupt discussion on the newsgroup. Previously in 1995 Helena Kobrin, an attorney for the Church of Scientology, attempted to remove the a.r.s. group from Usenet. Kobrin sent a rmgroup message which stated: "We have requested that the alt.religion.scientology newsgroup be removed from all sites". This later led to a declaration of war by the hacker group Cult of the Dead Cow, and an increase in popularity of the a.r.s site. This initial conflict came to be known as "Scientology versus the Internet". The post from Jacobsen went on to criticize the actions of the "Anonymous" group, stating: "We're supposed to be the good people," and stated that contrary to the Anonymous group's tactics, "Our weapons as critics are reason, evidence, argument, and free speech". On Tuesday, the founder of Operation Clambake, a non-profit organization and website critical of Scientology based in Stavanger, Norway, released a statement about the attacks by "Anonymous". Andreas Heldal-Lund was critical of the "Anonymous" groups actions, stating: "The author of Operation Clambake does not condone such activity. Attacking Scientology like that will just make them play the religious persecution card. They will use it to defend their own counter actions when they try to shatter criticism and crush critics without mercy." Heldal-Lund went on to emphasize the right of all people and organizations to freedom of speech - including the Church of Scientology: "Freedom of speech means we need to allow all to speak - including those we strongly disagree with. I am of the opinion that the Church of Scientology is a criminal organisation and a cult which is designed by its delusional founder to abuse people. I am still committed to fight for their right to speak their opinion."